Opposition to bylaw P-6 has now reached the mayor’s office. Pressure and criticism are mounting against Montreal police as protesters continue to be arrested by the hundreds under legislation detractors say is unconstitutional. The two main municipal parties both came out against the bylaw Monday, and a vote to repeal the bylaw is expected April 22. Amended last May in response to increasing protests during the student general strike, new sections of the bylaw render protesting in public space illegal if a route is not provided to police at least 24 hours in advance. Participants are also forbidden from concealing their faces while demonstrating. “These provisions of the bylaw easily lend themselves to discriminatory enforcement and application,” wrote Nathalie Des Rosiers and Cara Faith Zwibel on behalf of the Canadian Civil Liberties Association, in a letter to interim mayor Michael Applebaum dated April 2. A second letter from the CCLA was also sent to Service de Police de la Ville de Montréal chief Marc Parent. Last May, the Quebec Bar Association also openly denounced the new bylaw sections as a violation of legally protected rights to free expression and association. First-time offenders can be fined anywhere between $500 and $1,000, though are usually fined $637, a sum which includes added fees. 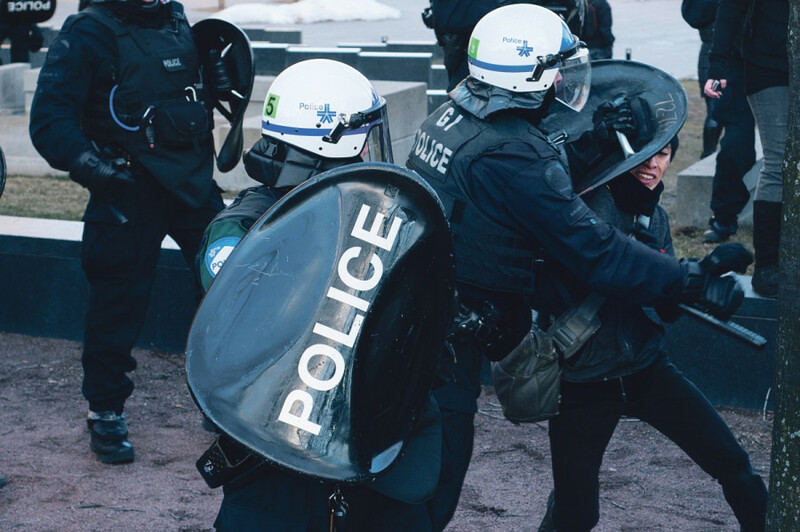 While not widely used over the course of the student protests against tuition increases last year, SPVM officers have escalated their use of the bylaw since February—often detaining protesters en masse by corralling and boxing in the entire group in a tactic known as kettling. At least 250 people were kettled, ticketed and released during the annual anti-police brutality protest on March 15. Arrests began before the demonstration even started. 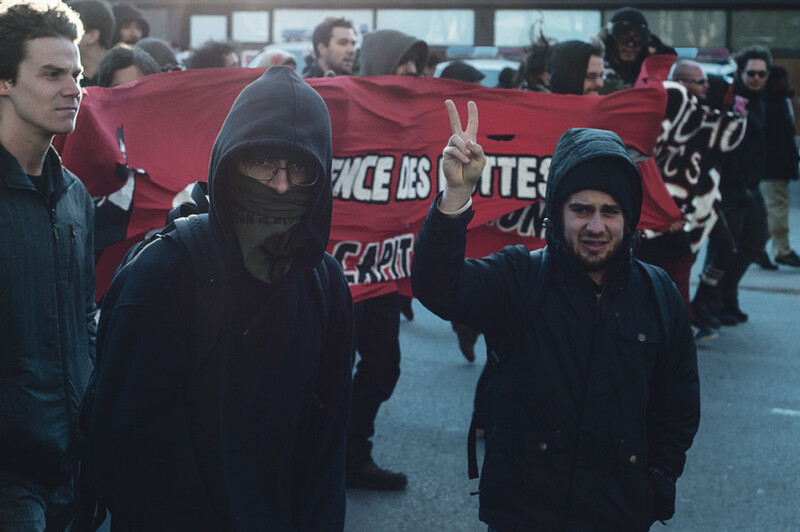 A second demonstration, which took place three weeks later in response to police action during the March 15 protest, was not much different: 279 protesters were fined for P-6 violations and three arrests were made for assault on SPVM officers April 5. Police cruisers and vans had barricaded the protest around Parc Émilie-Gamelin, the habitual meeting point for demonstrations, keeping protesters from their intended march. Riot squads surrounded the crowd after it circled the park, kettling and then ticketing the majority of protesters near de Maisonneuve Blvd. According to event organizers Anti-Capitalist Convergence Montreal, a route was purposely not provided to police. A coalition of 31 local community organizations, including CLAC, is speaking out against the escalating kettling strategy towards protesters. “One clear goal of the police tactic is to scare demonstrators and potential demonstrators from taking to the streets,” they said in a statement released March 28. Even at the height of last year’s protests, some of the most iconic faces were concealed—many with scarves or bandanas, but one in particular with a panda bear costume. Originally meant to help diffuse hostility between police and protesters, “Anarchopanda” quickly became a staple of the Maple Spring protests. The CEGEP philosophy professor behind the suit, who asked to not be identified by name, says he has already received multiple tickets from police for sporting his velvety, black and white disguise. The costume-clad teacher was one of the 279 detained in the police kettle last Friday. SPVM officers also seized his panda bear head. According to the Anarchopanda creator, he received two $637 tickets that evening—once for illegal assembly, and again for masking his face while doing so. 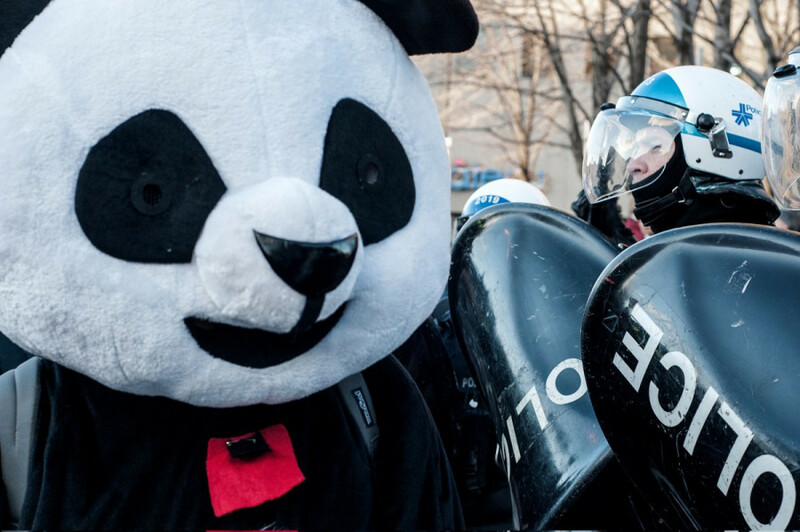 In a press conference last week, SPVM spokesperson Daniel Lacoursière said the panda head may be used as evidence against Anarchopanda in court. But the CEGEP professor is still not convinced the head could be seized. “My understanding is it’s a municipal ticket […] if I give you a ticket because you’re missing a light on your car, I don’t confiscate your car as a piece of evidence,” he said, adding he is seeking legal council to determine if the seizure was lawful. A spokesperson for the SPVM told La Presse Monday the Anarchopanda head will be returned, though it was not actually returned until yesterday. Collective challenges are also being prepared against bylaw P-6 infractions, revealed the Anarchopanda creator. “We are going before the courts in October, it seems, to contest [the bylaw],” he revealed, although was unable to provide more information at this time. Despite having his head withheld for the moment, the man behind Anarchopanda says it will take more than losing a plush helmet to get rid of this panda. “There will be more costumes, for sure,” he vowed, adding he has no plans to cut back on protesting either. He also says he is helping start a collective fund to help protesters contest P-6 infractions. 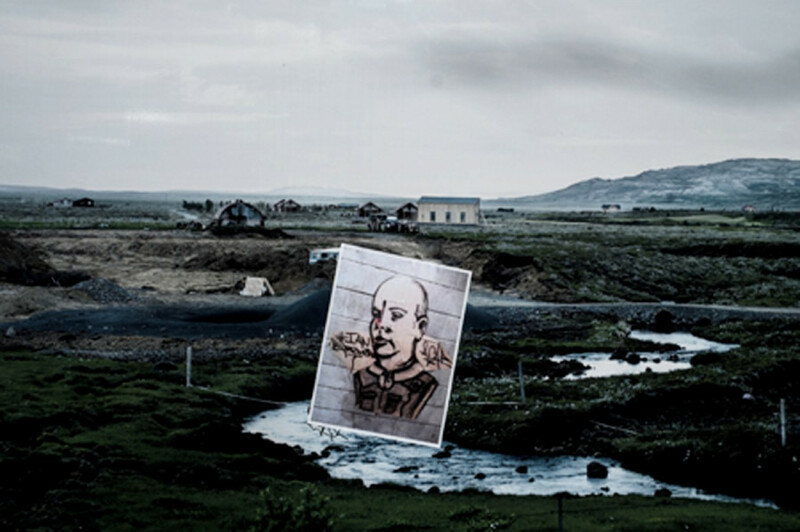 “I think more and more people are getting outraged about it, and we want to get more and more information about its implications in the wider public,” he said. And while still very much tied to the student strike movement, the initiative is seeing some traction, Anarchopanda’s creator says. “Half the people who were there were not students at all, you know, they were anybody against the bylaw P-6,” he said.